I recently bought the coolest flower die. It makes gorgeous cherry blossoms. I made them in an unusual colour combo but I love that I can personalize them! The colours of this card are epecially unusual to anyone who knows me well. Orange is one of my least favourite colours but I have been know to use it under the right circumstances like as an accent, when I love the paper pack or when the person I am making the card for loves bright colours! The latter is the case this time. Oh, and my blonde little guys look awesome in orange so you might see it on a scrap page at some point! Making the blossoms is easy. Die cut all the pieces. I cut all of mine from ivory card stock. Then I coloured the star shaped piece with an apricot marker. Same for the center of the sunburst shaped piece. The little ‘sticks’ I coloured in blush and the tips are pumpkin. The sticks and tips are coloured on both sides. The flowers are sponged with blush ink. To make the flower 3-D, you glue the tab to the back of the next petal. However, I found it was hard to get the tab to stay glued as it is tiny, less than 1/8” long! When I make it again, I won’t glue the tab first. 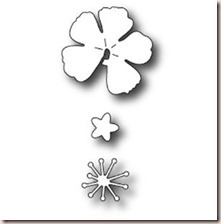 To prepare the center, use an embossing tool and a foam or embossing mat to cup the star piece. Repeat for the sunburst. Then adhere the sunburst to the inside of the star. Now you want to curve the petals and squeeze the flower into a cup shape. Then add adhesive to the outside of the cupped center and the tab and add the center to the flower. 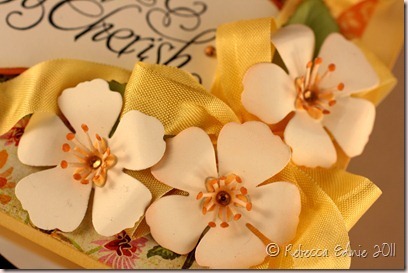 While holding down the flower center with the embossing tool, make sure the tab is touching and hold until it is dry. All done! I’m entering this in the Joan’s Gardens challenge this week and this April’s SFYTT (turned 90 degrees). Joan is offering 6 guest designer spots for participants! I’m really hoping I get a chance! 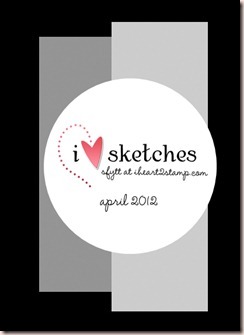 Ink: memento black, Apricot, blush, celery-SU! Paper: Picadilly-Basic Grey, saffron, vanilla, punpkin-SU! Love your card! It is so pretty. I love the colors you used..I haven't seen that die before and now you have me wanting it..The flowers you made with it are awesome. The centers are super cool. Your flowers are beautiful Rebecca. 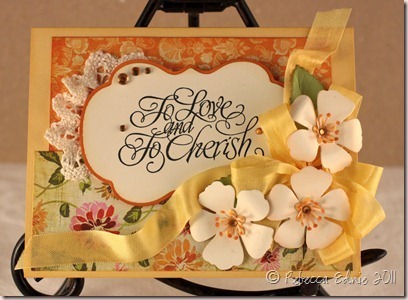 The orange background really helps make the ivory flowers “pop”. Your card is gorgeous. Thanks for joining us in our challenge at Joan's Gardens.